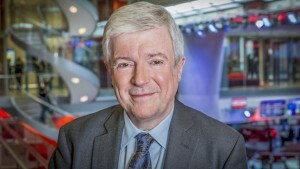 Tony Hall, Director-General of the BBC, has suggested a fourth element be added to the Reithian vision for the Corporation, telling delegates at the Media & Telecoms Conference 2016 in London that ‘to inspire’ join ‘inform, educate and entertain’. “It is something that the BBC can uniquely do,” he suggested, noting that “overwhelmingly” respondents to a Government consultation wanted the BBC to remain independent from government and politicians. An engine of growth for the UK’s creative industries and one of the UK’s most valuable, global brands. “Last month, the Lords Select Committee lent its support to a universal BBC, and found ‘no compelling evidence for a reduction in scale or scope. Then, there was the report from the Commons Culture, Media and Sport Committee. It starts by saying: ‘The BBC is an extraordinary national and global institution’ and then goes on to say ‘But the BBC also has a role as a beacon of enlightened values of openness, freedom of thought, toleration and diversity…’,” he advised. “And then there’s the public, who certainly believe in a strong BBC. With nearly 200,000 responses, their reaction to the DCMS consultation was second only to the record-breaking response on gay marriage. The DCMS described it as ‘unprecedented’ because – as they pointed out – there were very few identikit responses. The responses were no cut and paste job. They were individually written. According to Hall, their message was clear. “The public want more BBC, not less. Over 80 per cent said the BBC is serving audiences well – around three-quarters said our services are high-quality and distinctive. Three-quarters support the licence fee, and three-quarters think we deliver value for money. Overwhelmingly, they want us to remain independent from government and politicians. Overwhelmingly, they want us to be universal,” he said. According to Hall, the BBC has to be independent to do the job expected by its audiences. “And we need to have the safeguards in place that mean we are also seen to be independent. That is why so many have called for the White Paper to make the BBC more independent. And that is why I welcome last week’s review of governance from Sir David Clementi,” he stated, noting he was the first Director-General to call for external regulation of the BBC. “Sir David’s proposals would do just that – and bring about the most significant change in governance and regulation of the BBC in its lifetime. It would provide clarity – the new unitary board of the BBC would set strategy and execute it, and Ofcom would assess performance against its own framework and direct any changes necessary,” he advised. “It would streamline and simplify the responsibilities and processes for the BBC and Ofcom. As the Secretary of State put it last week, Sir David’s ‘ideas for the principles of simpler Governance structures and streamlined regulatory arrangements that have public interest and market sensitivity at their heart, are ones that it would be very difficult for this – or indeed any – Government to overlook’,” he reported.